I was hoping to publish stats for January, but there was a problem with the web server logs not importing correctly for awhile. Everything’s cleared up though, so here we go! Right now my primary interest is in planning for Paint.NET v4.0 with respect to determining system requirements. In other words, will it be possible to drop support for XP? The reason I’m trying to answer this is because I want to pervasively use Direct2D, DirectWrite, and DirectCompute while also not incurring an onerous development and testing burden. I want to render everything at high quality, and to use hardware acceleration where possible. These APIs are not available on XP. It appears to be feasible to write a Direct2D-to-GDI+ translation layer, but the other two APIs are not nearly so simple. I cannot justify dropping XP support if everyone’s still using it, or if there isn’t enough of a benefit. This decision must be guided by quantitative data, and not my desire to play with the latest and greatest along with fatigue from supporting ancient systems. One simple solution would be to just keep the last v3.x release available for download until XP support has dwindled far enough. Time will tell. Anyway, hopes and dreams aside (please upgrade to Windows 7! ), let’s see the stats! 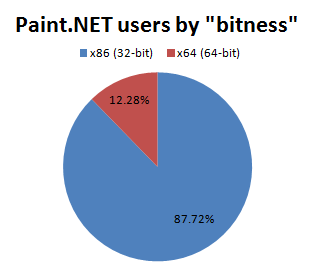 The last few months have been huge for Paint.NET since the release of v3.5. The greatly improved performance and Aero UI theme have been very popular, and the “Install When I Exit” update mode has netted me more than a few e-mails full of thanks, praise, and smiley faces (glad you all like it!). I have not been working on new code or features, and instead have focused on relaxing and planning for v4.0. I plan to resume in earnest when Visual Studio 2010 is released; until then, I’m trying to finish Mass Effect 2 (renegade ftw) and BioShock 2. Anyone played Heavy Rain? Talk about mixed feelings; at least it didn’t suffer nearly the same fate as Indigo Prophecy with its awesome beginning that was quickly slaughtered by nonsensical, random plot twists and overly ridiculous quick time event sequences (they should have called it “Dance Dance Simon Revolution”). Oh, and I finally managed to get my Core i7 overclocked to 4.0 GHz by installing this beast. Overall, usage of Paint.NET is up by a whopping 45%! The other two areas I’ve been hoping for big gains are in 64-bit and Windows 7, and boy are they on a roll! There are 212% more 64-bit users than last July, and Windows 7 is zipping up like a rocket and already claiming over 18% of the user base. Popularity with Russian users is way up, with most other languages staying about the same (technically English is down but this is probably just a result of the increase in the Russian stat). Window Server 2003 continues to have a negligible number of users. I see no reason to discontinue support (e.g. hard block at install time), as it’s basically the same platform as Windows XP. I do not test with it though, so it’s a “best faith” effort. I don’t have separate stats for Windows 7 and Windows Server 2008 since they report the same version number (6.1.7600), and I don’t track the OS edition (workstation vs. server) with my update manifests. And lastly, here are the raw numbers. Please note that “hits” refers to update manifest text files, not web site traffic in a browser. They are the result of an installation of Paint.NET being active and checking to see what the latest version is. Paint.NET doesn’t check for updates unless it’s open (no TSR’s), and it checks every 5 days at most (longer if it hasn’t been opened in more than 5 days, of course). Bold indicates that Paint.NET ships with the translation. Korean had a translation in v3.36, but not in v3.5+. For Russian, the reverse is true. As a user of both XP (work) and Vista (home), I like the idea of dropping XP support in 4.0 and leaving 3.x available for download for XP users. Once large companies decide to upgrade to Win7 (after SP1? ), I think XP numbers will start to drop quickly. I think the best way is to leave “classic” version for XP users and update it only for bug fixes, develop new version without looking back. Of course there will be a lot of people who would want new version on XP, but hey, we want progress now and not in 5 or 10 years when XP usage will drop to insignificant numbers. And Win7 is wonderful OS, it works fine even on netbooks(though you should have at least 1 Gb RAM). I see my workplace has rolled out Paint.NET on our XP machines. Wonder if your stats account for these thousands of installations behind a strong firewall? Our install is many versions behind and I suspect would be rarely updated. Those of us who read your blog are (of course) always on the latest version, running the latest versions of Windows. I’m all in favour of you dropping support for XP. It’s not as though you’ll be “doing an Apple” (i.e. removing it from your “store”). The current version is wonderfully good, so I doubt you’ll get too many complaints if the XP people have to stick with it. Nope. Can’t think of a single compelling reason for you supporting XP from now on. Except of course if someone discovered a critical Paint.NET security flaw. Then you’d need to patch the XP version. Lance, re: stats for behind a firewall. I don’t believe so, since Paint.NET doesn’t always work with firewalls. And, if you install via the MSI method, the default is to disable auto-updates. In fact, if you enable auto-updates it won’t work right! The assumption is that if you’re doing MSI-based deployment then you’re asserting responsibility for maintaining the versions and updates of everything on the system (which seems to be generally true). Though I’m a user of XP, I still support your dropping support for it. Don’t let compatibility with a 9-year-old OS get in your way of greatness. Also, by the time you roll out 4.0 with features requiring a newer OS, a lot more people will have bought newer laptops with Win 7 on them. I personally can run neither Vista nor 7 because of a lack of good drivers for my old laptop. 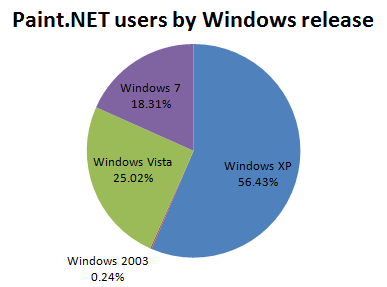 It’d be interesting to see stats on installed .NET versions, specifically percentage of users running .NET 3.5 SP1. Stuart, I don’t have those stats quite exactly. I can tell you that 2/3rd of the users are on Paint.NET v3.5 or newer, which requires .NET 3.5 SP1. That gives an upper bound of 1/3rd who only have less than .NET 3.5 SP1 installed. It’s also worth noting that Paint.NET automatically figures out whether a new .NET version is needed, and will automatically install it if necessary. Personally, I say drop XP. Given that this is your personal project and given away freely, why shouldn’t you set the requirements to make things easier and more interesting for yourself? I presume it will also lead to a better product, more quickly developed, if you no longer have to code for and test old operating systems, so it’ll be a win for us users as well. Leaving 3.5 available for XP users seems a more than fair compromise. I’m one of those negligible Window Server 2003 users. So, you’re getting some validation here. Over half of your users are on Windows XP, and you’re considering dropping support for it? If you were a software vendor, I’d say you’re crazy. But, because this is your project, your goal doesn’t have to be to maximize usage. If you want to maximize functionality, and dropping Windows XP helps you do that, then you’re free to do so. But, the fact that you’re proud of your increased usage makes me think that you enjoy seeing your product used by as many people as possible. Would you consider charging for the product to support development? With 4 million hits in February, if .01% of those hits paid $10 for the app, you’d make $400,000. I didn’t see what the install base was, so I’m just making a guess based on web site hits. Jim, those “hits” aren’t the same as users. They are hits on the webserver to the update manifests (text files). One user could be responsible for any number of hits. Or just 1. Or zero. I don’t have precise data on the size of my user base. Also, I wouldn’t be dropping XP support until v4.0 shipped, which is probably 2 years away. I’m simply doing forward planning and thinking on this right now so I can setup the code to use things like Direct2D and DirectWrite. The trend is clear that XP’s percentage is dropping and Win7’s is going up very fast. 4.0 Sounds like a considerable release. I guess it will take quite sometime to produce a stable version. So you should consider what Paint.net’s users will be using, not what they are using right now. Also you mention that 4.0 is to essentially build the next generation components of Paint.net. No point developing software that supports a 9 years old OS and that will not be getting any younger soon. The Windows community needs to face facts. MS has tried to be nice, but we are in transitional stage from the old way of doing things to the new. Much like the Mac community in the Classic to OS X transition. At some point we need to draw a line. Besides maybe next gen software like Paint.net 4.0 will encourage people to upgrade. Go for the Direct Compute / 2D / Write path. We want only the best from Paint.Net. I do hope you’ll have Paint V 4.0 in less than 2 years. Me too. Not supporting XP will help out a lot on that. I am an XP user. But I say you should drop support. Until 4.0 is ready, many users will have updated to Windows 7, and if not they can still use the 3.5 version. Marcus, well I work at Microsoft (although Paint.NET is not a Microsoft project). So, they already pay me money (albeit not for Paint.NET). I think XP could be dropped if backwards support would be brought by offering 3.5 version as historical download for XP users. One thing I’m really looking for is dynamic effects similar to Fireworks (based on layout masks, I believe). Another extremely important feature (for me) would be vector based primitives, since it’s way easier to mock up web-design with modifiable elements. Reaktor, Paint.NET isn’t going to support vectors. I’ve never said I was going to add that feature, so I’m not sure why you have been expecting it. Use Inkscape for that. I’d just like to say that your completely random and unexpected tangent on the video games you’re playing recently was hilarious and awesome. I approve! Rick, vectors in Fireworks CS3 are a little different than in Inkscape. They always operate within the context of a bitmap image. So, for example you can create a shape and drag it about, change it’s shape and fill, apply live-effects like drop shadows and inner glows, then in to a to pixel grid to see the effects close-up. When you’re done, you save a flattened bitmap image in whatever format, GIF, PNG, etc that you like. It really is an extraordinarily productive way to work on graphics, particularly those that are intended for the web. I love Paint.NET and use it a lot, but for professional work always I turn to Fireworks (and pay $300 for the privilege). Jon, so once you’re “done” with the shape, it is rasterized into the image as a new bitmap layer, and after that you cannot change it? No, it remains as an object in a layer tree that you can go back and change later. The whole tree is rasterized on the fly to present the editable image, which updates whenever an object or layer changes. If required, you can select one or more of objects and flatten them to a “bitmap object”, or export the entire image in a flattened format like PNG. Hey, Rick. I have been using paint.net for a long time. Its the best program on my windows XP, (even better than sony vegas, in my opinion. )Thats why I REALLY don’t want you to take it away from XP. From that pie chart, im sure LOTS of people wouldn’t want it away. I like paint.net so much, if its discontinued for XP, I might even upgrade to vista, for only that. Drgrit, Let’s turn this around. Please upgrade to 7/Vista so that I won’t be so incredibly burdened with supporting such an ancient OS. I’m 1 guy; the amount and type of work that was involved in getting v3.5 to work on XP was horrible and almost made me give up on the project entirely. In any event, the decision’s already been made and Paint.NET v4.0 is proceeding with Win7/Vista as the minimum OS. And don’t confuse “not supporting in future versions” with “taking it away.” Even if you’re still running XP when PDN4 is released, it’s not like your old copy of 3.5 is going to be deleted. Oh darn, too bad. I actually wasn’t expecting Paint.Net to have semi-vector support, but I was hoping it could have been future feature. I dislike inkscape for multiple reason, and one is that it lacks bitmap-features completly. Fireworks let’s user to kind of “correct & reshape” old primitive plots afterwards, so that final layout can be done without plotting multiple primitives to correct the original shape. Anyway, thanks for keeping up the good work. I don’t want to sound whining, but what keeps paint.net from supporting vector-style path-fills for few basic primitives? Are there real technical issues to keep x/y info for path points and control these points after they are rendered? Mainly I’m looking for resizable box (with ability drag points to mishape box a bit) and circle, since all the other objects can be easily delivered from these primitives. Resizable box helps to play around and shape layouts when used on separate layer and the final layout can be worked with current tools when shapes have found correct places and height/width.